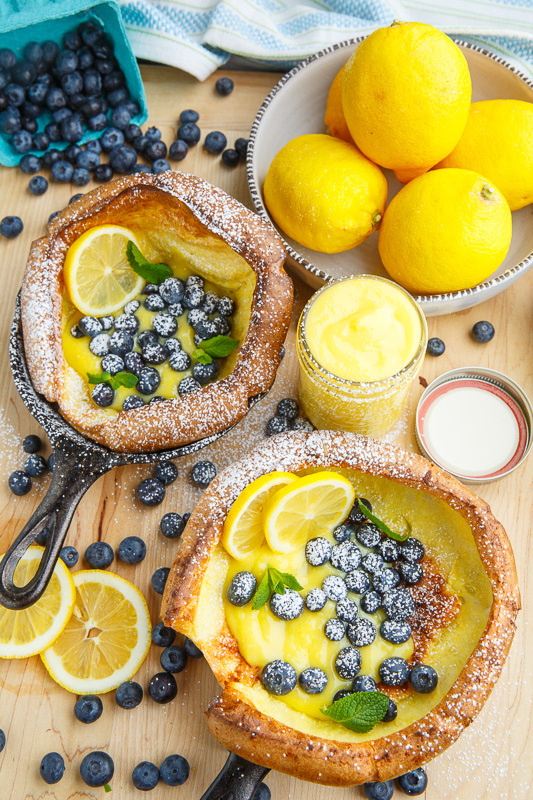 Light and fluffy, cloud like, dutch baby pancakes filled with lemon curd and fresh blueberries! 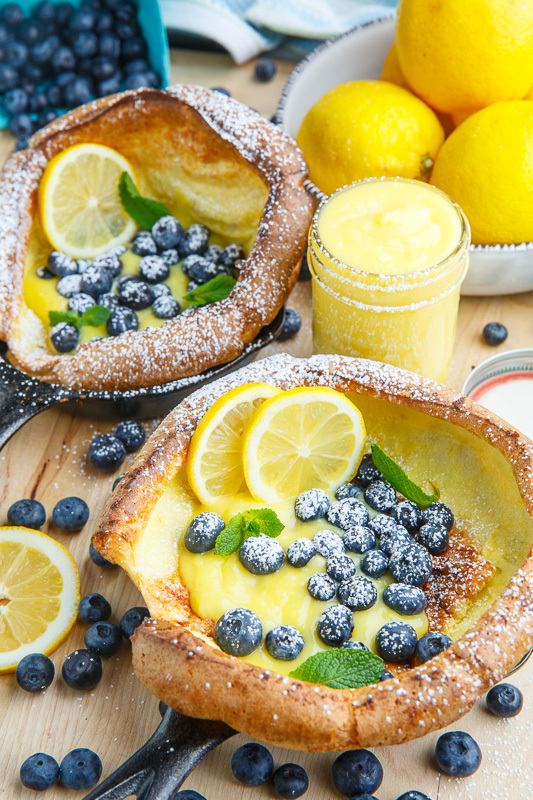 Easter is this weekend and I was looking for some ideas for a nice breakfast or brunch and when I came across a recipe for dutch babies with lemon curd and blueberries on Nerds with Knives I had found what I was looking for! 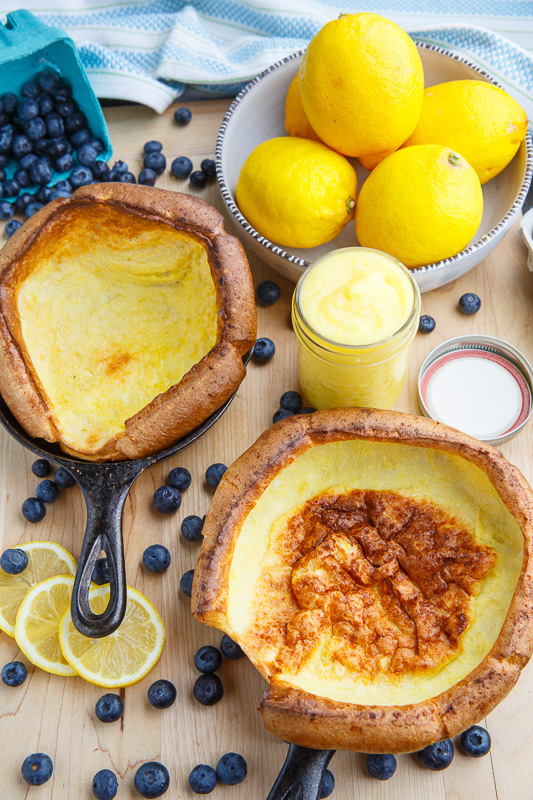 Dutch babies are a kind puffy pancake, rather like a popover or a yorkshire pudding, where the batter is baked in a pan until it gets all nice and golden brown and puffy! When removed from the oven the the puffy centre sinks in and you can fill it with tasty things! I usually like to make these as savoury treats with my spring favourite being asparagus and double smoked bacon popover but it’s also really nice when on the sweet side. 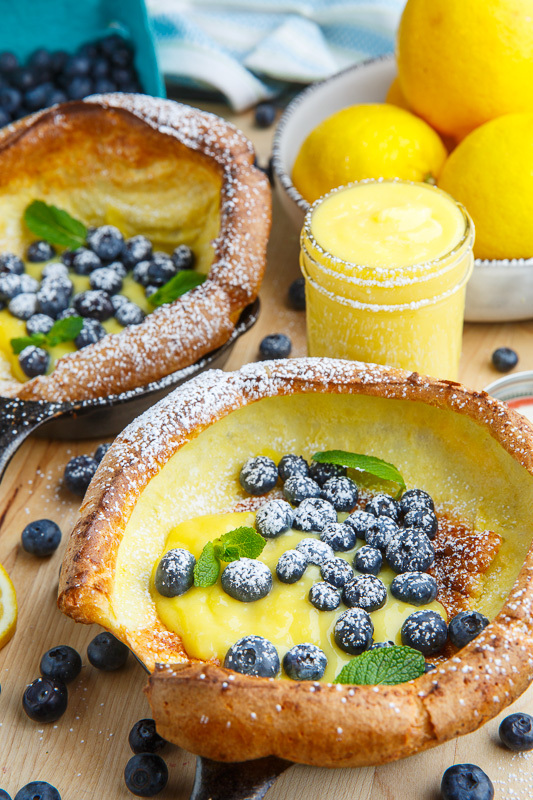 These dutch babies are filled with a cool, creamy and intensely flavoured homemade lemon curd along with fresh blueberries making them perfect for both Spring and Easter! Place the butter in a large (10 inch) oven safe skillet, place in a preheated 425F/220C oven until the butter melts, about 30 seconds, before pouring in the mixture of the eggs, milk, flour, sugar and salt and returning to the oven to bake until puffed and golden brown, about 15-20 minutes. Let cool until the puffing goes down before filling with the lemon curd and blueberries and sprinkling on the powdered sugar and divining to serve. Option: Add 1 teaspoon vanilla extract to the batter! Option: Add the zest of one lemon to the batter! Option: Use several smaller skillets for individual servings! These look absolutely wonderful Kevin!! They would be the ultimate Easter breakfast! These are screaming my name! The recipe looks really great. It says it serves 4. Does that mean you use 1/4 of the batter to make 4 Dutch Babies, or do you make 1 Dutch Baby and it feeds 4 people? The recipe is not clear on that point. I am dying to make this dish as it looks absolutely delicisou. 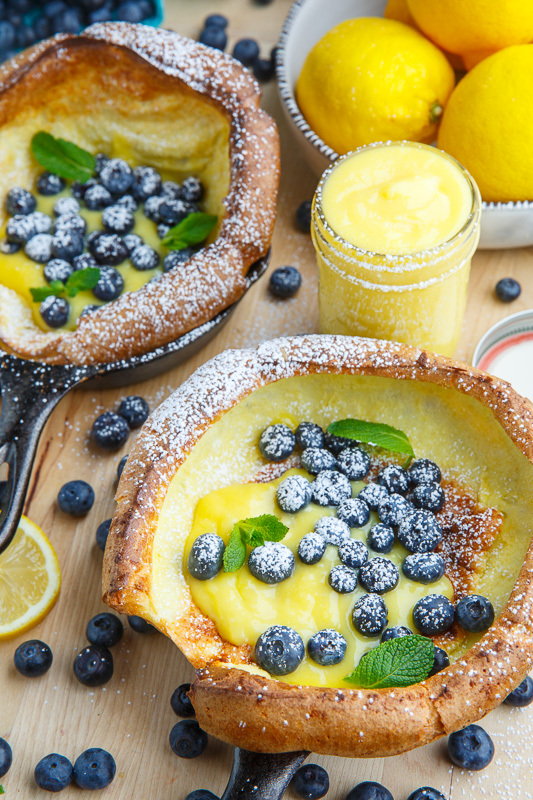 I love dutch babies, but these are seriously the most beautiful ones I've ever seen!! Anonymous: You can make one large one and divide it into 4 servings or make small smaller, individual servings. Enjoy! jimbo: I will try bread flour next time to compare! Now this is perfect for Spring time parties! So pretty too! Made these toniggt. So good. I only had frozen berries. I think fresh would be better. Thanks for sharing. 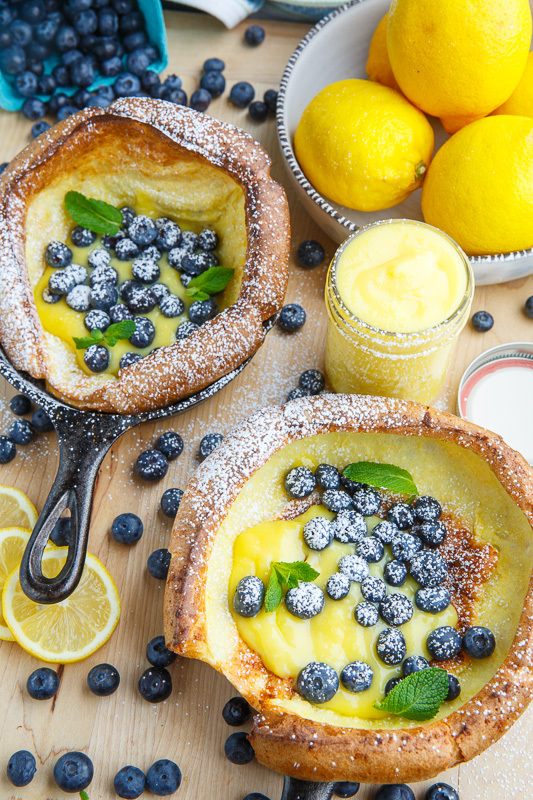 For those who are allergic to gluten, what would you recommend swapping the flour with to get the same fluffiness of the Dutch babies? I have not experimented with different forms of gluten-free flour so I am not sure. If you try some and find one that works well, I would love to know about it! Kevin I have enjoyed your recipes and photo very much but anymore I am sorry to say you have so many pop up ads on your blog I just can’t even look at your content.